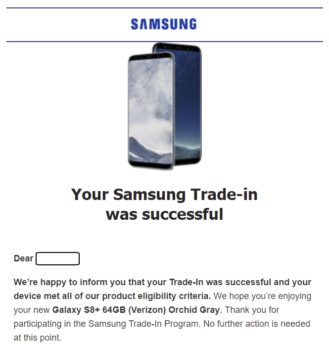 The original offer was simple: you'd purchase an unlocked, AT&T, US Cellular, or Verizon Galaxy S8 or S8+ between June 2nd and June 25th with the $200 discount, and after trading in any device in "good condition" within 15 days of receiving your S8, Samsung would send you a confirmation email. If your trade-in didn't qualify, you'd be charged $175 (all trade-ins are worth at least $25, regardless of condition) from your original payment method, and it would not be returned to you, as "by shipping the device to Samsung, you agree to transfer title and ownership of the device to Samsung. You disclaim any and all right, title or interest in and to the Trade-In Device, including the right to sell, dispose, or otherwise collect, where applicable, the its value." "Good condition" meant that your phone would turn on and hold a charge, have a working display, have no cracks or breaks, not be on a blacklist, have no water damage, etc. That $200 number would increase to $300 for a Galaxy S7 or Note5, and $350 for an S7 edge. You also had the option to purchase the new Gear 360 for just $49. Pretty straightforward, I think. Personally, I was genuinely enticed by the offer, despite already owning a T-Mobile S8+. Naturally, people began digging around for ultra-cheap phones that were eligible so that they could get $200 off the rather expensive Galaxy S8 phones at nearly no cost. Given the promotion's relatively loose constraints, many simply purchased a cheap prepaid phone from stores like Target or Walmart and called it a day. For instance, the Slickdeals thread suggested the $9.99 Alcatel OneTouch Pixi Eclipse from Walmart, which is of course now sold out. Others just grabbed an old phone out of their drawer. Your original method of payment will be charged $175. Others, including some of our readers, had similar experiences. After combing through some comments on Slickdeals and reddit, I compiled a list of successful trade-ins, and another for unsuccessful ones. "an old Plixi tracfone... I think I paid $2 for it"
HTC Titan II (Windows) in "immaculate condition"
Samsung Galaxy Nexus, used as a "pooping phone"
"brand new pre-paid alcatel phone"
Alcatel Ideal 4G LTE in "very good condition"
Samsung Galaxy S5, "worked perfectly before I sent it in"
We received a few tips that supplied some details. One reader sent in one of the $10 Alcatels from Walmart and opened it to make sure it satisfied all the requirements, but was denied because his device reportedly had a screen issue. Another sent in an iPhone 4s that was in "very good condition," held a charge, and had Find My iPhone disabled, yet was denied for the phone being blacklisted. Yet another sent in a fully-functional Galaxy S5, but was rejected for the phone "not powering on or holding a charge." There's clearly not much setting the accepted phones apart from the unaccepted ones. While the uber-cheap prepaid phone trade-ins are working for some, they're not for others. Even an older Moto G that was thought to be blacklisted went through. Hell, a GNex that the user called a "pooping phone" went through. It's also worth reiterating that unsuccessful trade-ins were not returned to customers, meaning that someone got only $25 for a five-month old Note5, a phone that still commands around $250 on the used market. 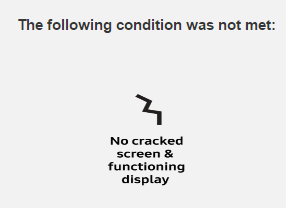 Looking through Samsung's trade-in FAQ and terms and conditions pages yields no answers either. I actually called Samsung's support line earlier in the week for a different issue, but couldn't get a representative on the phone after a full hour of being on hold, presumably because of angry customers who've just had their credit cards charged an unexpected $175. We've reached out to Samsung regarding this issue, and will update this article when we receive a response.